11 AM to 4 PM. (Charlotte/Gastonia, NC) - The Academy of Aviation, managers of the Gastonia Municipal Airport, is hosting this event on May 4, 2019 (rain date May 11, 2019) to honor those brave individuals that run toward emergency situations, providing help and relief to fellow citizens. The event will focus on the responders and how they manage their complex duties, utilizing each department’s specialized equipment and services. The day will celebrate the conduct of these responders and provide an educational opportunity to citizens by allowing them hands-on demonstrations and seminars. During the event, funds will be raised for charities in support of police, fire and emergency management departments. The Event will be opened with an American Flag Color Guard marching into position followed by the Pledge of Allegiance and national anthem. Academy of Aviation’s First Responders Appreciation Day will feature a full day of events, displays, seminars and activities, including tours of official land vehicles, aircraft, heavy machinery, military weaponry and rescue equipment. Members of police, fire, rescue, national guard and Academy of Aviation flight instructor teams will be providing insight and be available to answer questions, create dialog and exchange ideas with the public; and presentations will include live fire exercises, crash and fire rescue, first aid, search and seizure and jaws of life demonstrations. Attendees will have the opportunity to hoist a working fire hose to see what it really feels like to be a first responder. Food trucks and pet adoption areas will be a highlight for kids and adults alike, and police, fire, EMS and military recruiting tables will be on hand for anyone interested in learning about these amazing career choices. Academy of Aviation’s First Responders Appreciation Day will also include fund raising opportunities with raffles and merchandise benefiting local charities, and invitees to the event are comprised of prominent members of the City of Gasonia’s local government, the mayor’s office, council members and clergy-- coming together with the purpose of making sure all first responders know that their contributions to our city has not and will not go unnoticed. Visit our Facebook Event Page here. We are a Cessna Pilot Center and Cessna Authorized Service Facility. 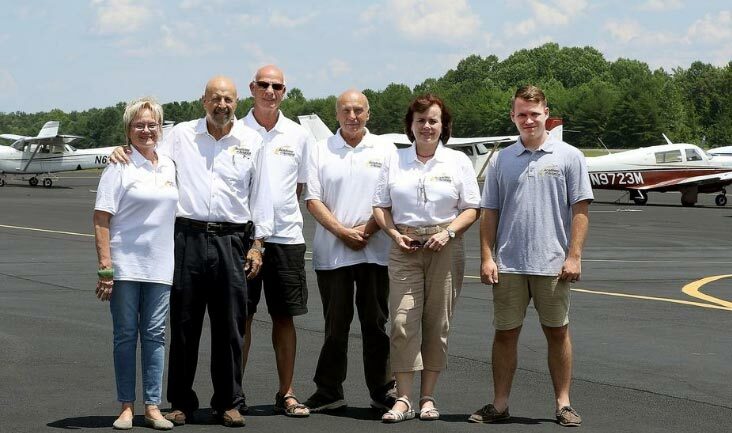 We welcome and teach both career airline and private recreational flight students. Learn to fly for work or for fun. Recreational and career flight training programs. A full student Financial Aid option is available for our Career Pilot program. Flight Training in the Charlotte/Gastonia metropolitan area of North Carolina gives the aspiring pilot a unique experience of learning to fly close to one of busiest airspaces in the country near Charlotte Douglas International, in addition to mountain valley, forest and coastline areas of North and South Carolina. Contact our Admissions Department today to schedule a campus tour or test drive our fleet by booking an introductory discovery flight: (704) 869-7844 or fill out our Online Form for more information. As of July 1, 2018, the City of Gastonia has awarded Academy of Aviation (AOA) the management contract for Gastonia Municipal Airport (KAKH). Visit us today and see why Academy of Aviation is an excellent choice for your flight training. 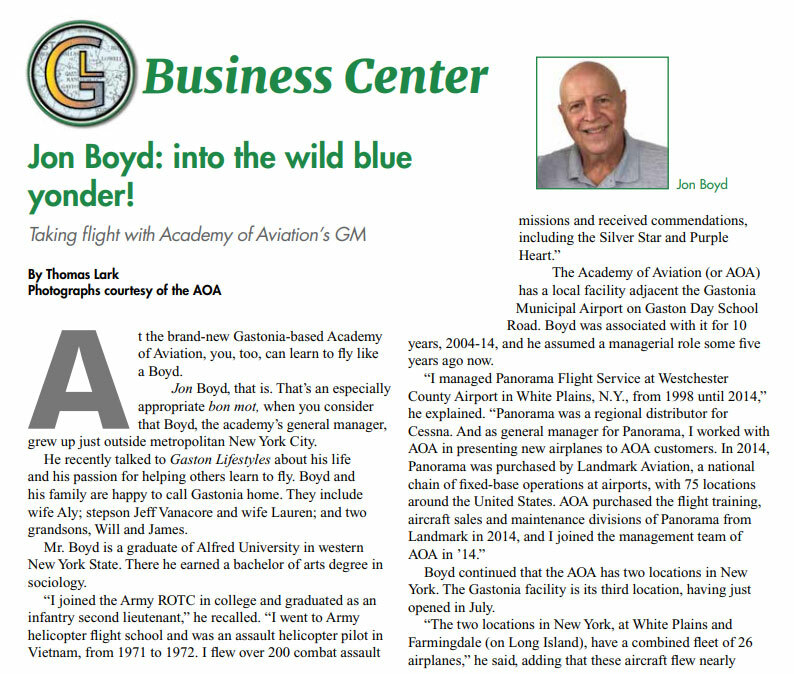 Academy of Aviation in Gastonia, NC is gaining some great attention down in North Carolina. Here is a cool article about our General Manager of AOA Gastonia, and some information about our newest location. Click to open the full article. There is a growing demand for professional airline pilot training and recreational flying lessons in NC and we are here to support you in whatever your pilot license aspirations may be. Our flight school prides itself in offering flexible scheduling for customers with a busy work or school schedule. We map out your flight lessons to keep you progressing quickly without compromising efficiency or safety. Gastonia Municipal Airport Charlotte/Gastonia, North Carolina, KAKH - map and directions. Ask Us. We are here to help. We understand that choosing the right aviation school can be overwhelming with so many options. Flight training curriculum isn't the easiest to understand as a new pilot. Our Admissions Department is ready to answer your questions about flying lessons and we'd be happy to help you compare flight schools that you are researching. This is a huge decision and you want to choose a school that fits your training needs. We look forward to assisting you with this decision, sharing our passion for cloud cruising and supporting your amazing choice of becoming a pilot. FAA 141 Approved at our Farmingdale and White Plains Locations: Private Pilot, Instrument, Commercial Pilot, Multi Engine and Flight Instructor Certificate and Rating Part 141 courses at our Farmingdale and White Plains locations. FAA Part 61 Courses are available. VA Approved: Use your benefits towards flight training. ACCSC Accredited: Setting standards of educational quality. International Students: Advance your career with FAA pilot licenses and ratings.